There are many stairlift companies and mobility shops advertising cheap stairlifts but don’t be fooled as this could well be a cunning sales ploy. I’ve heard horror stories before where a stairlift is advertised as starting from £1195 or less and as soon as the sales person arrives a list of so called extra’s rolls off the tongue such as remote controls, swivel seat and a seat belt suddenly making the stairlift not so cheap. 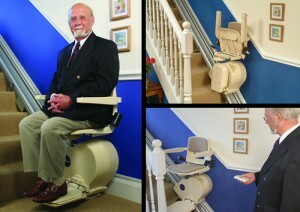 In fact most of the time these items already come with the stairlift at no extra charge to the supplier. The stairlift would usually only increase in price if it requires a hinge, platform, perched seat or requires a curved rail. Curved rails are much more expensive as the tracks are made to suit your staircase and would not fit any others rendering the rails virtually useless once removed. Also the stairlift may be advertised as being brand new however there are many second hand units being removed each day, if you purchase a new stairlift make sure it is new before purchasing. Once installed it may be too late but you can check the date of manufacture. There are however some genuine companies and mobility shops out there who have your best interests at heart. I would advise checking with the local Disabled Living Centre, Red Cross or local Social Services for a list of companies they recommend, generally these companies details will only be passed on if they continue doing a good job. I’d also advise sticking to a specialist supplier they are most likely to give you value for money and provide a quality installation. I’ve also added you URL to your comment, schoolboy error. Look below the category list on the right hand side of the site, your link says “Stairlifts & Mobility Leicester”, cuckoo! !